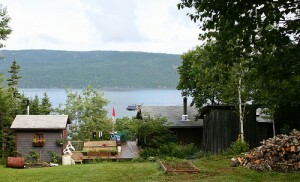 The Bras d’Or Lakes are literally at the heart of Cape Breton. Set right in the centre of the island, the calm waters of this inland sea offer some of the finest boating and kayaking anywhere, with no end of little coves to explore. Then there are the bald eagles that often soar overhead and charming spots to stop for a rest, like the tea room run by famous Nova Scotian singer Rita MacNeil in Big Pond. 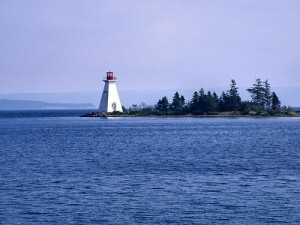 Coming from the mainland, start your exploration of the Bras d’Or region by taking Highway 105 through Whycocomagh, where you’ll find a provincial park and campground. A little further up the highway takes you to the turnoff for the villages of Englishtown and Big Bras d’Or, where boat tours run to the Bird Islands. Hop on board to see the rocky island where thousands of sea birds nest, including hundreds of Atlantic puffins. Return to Highway 105 and carry on until you reach the right turn towards Georges River, leading onto Routes 223 and 216, which both hug the coastline through the charmingly named Christmas Island. From here, a short diversion through Grand Narrows takes you to Iona and its Highland Village Museum, a hub of Gaelic culture. Next is the First Nations community of Eskasoni, from where you round the tip of the bay and come to Ben Eoin, long a popular vacation spot with beaches, campgrounds, a ski hill for winter visitors and a fiddle and folk festival every August. The musical theme continues as you reach Big Pond, where you must stop for a cup of tea at Rita’s Tearoom, owned and run by one of Nova Scotia’s most loved musicians. Big Pond also has its own incredibly popular summer music festival in July. A series of coves follows – Irish Cove, Hay Cove, McNabs Cove and Soldiers Cove – before you arrive in St. Peter’s, known as the gateway to the Bras d’Or Lakes. It’s here that you can explore ruined forts in Battery Provincial Park, once used to supply the fortress at Louisbourg. Walk along a canal connecting the lakes to the Atlantic Ocean and explore the home and works of famous marine photographer Wallace R. MacAskill. His photograph of the Bluenose Schooner is still reproduced today on Canada’s 10¢ coin. Keeping to the small road that hugs the lakeshore, offering spectacular views, you come to Dundee and another of Cape Breton’s top golf courses, the Dundee Golf Club. As the road turns north, always staying close to the water, you pass through Marble Mountain, famous for its beach made of white, chipped marble and 2 churches, both over 100 years old. Now you’re nearly back in Whycocomagh but before you finish your circumnavigation of the Bras d’Or Lakes, take time to see the railway museum in tiny Orangedale. Set in a station that dates back to 1886, it’s now restored with many period furnishings and memorabilia from a much busier time for the railroad in Cape Breton.